My son and I had lunch at Rock & Brews on Saturday in Terminal 1 of LAX. This is a GREAT Priority Pass restaurant. We arrived around 1:30 PM for lunch and were promptly seated. The restaurant was pleasantly filled, but not packed. The hostess placed us at a table closest to the entrance and the waiter assigned to our table did not notice us. I eventually flagged him down after about 10 minutes. The menu includes a nice selection of American and Tex Mex food, with the specialty of the house being Santa Maria Tri-Tip. Thanks to my American Express Platinum Card (or I could have used my Chase Sapphire Reserve Priority Pass card), my son and I each had $28 in restaurant credit via Priority Pass. I ordered a chicken quesadilla as an appetizer, then a Santa Maria Trip-Tip sandwich with French Fries and salad as well as a trio of tri-tip tacos. It took about 20 minutes for the food to arrive, so keep that in mind if you are running late or have a tight connection. But the food was worth the wait. All three items were delicious and the quesadillas and tacos were so much better than the sorry excuse for Tex Mex offered in Barney’s Beanery in nearby Terminal 2. I’m almost ashamed to admit that Augustine nearly polished off the whole chicken quesadilla himself (I had a few bites – we are working with him on sharing). My $56 in credit full covered the bill, though I asked the waiter to charge my card $0.01 so that I could leave a tip. Please leave a tip if you are paying with Priority Pass…it is the right thing to do. A couple more notes. First, there is a takeout section, which does not qualify for Priority Pass use. Second, the restaurant is open from 4 AM to 10 PM daily and your Priority Pass card is good any time of day. But note that if the restaurant is full, Priority Pass members may be turned away (that is up to the restaurant’s discretion). You don’t have to fly out of Terminal 1 to use this Priority Pass restaurant. All you need is a valid boarding pass from any terminal to clear the TSA security check. No one asked to see my boarding pass at the restaurant. Keep in mind that Terminal 1 is currently isolated from the rest of the airport meaning if you are not flying out of T1 you will need to exit the terminal and re-clear security again in your actual departure terminal. Eventually all terminals will be linked on the secure side (past security) but for now only Terminals 4-8 and the Tom Bradley International Terminal are linked while T1-T3 remain separate, stand-alone terminals. 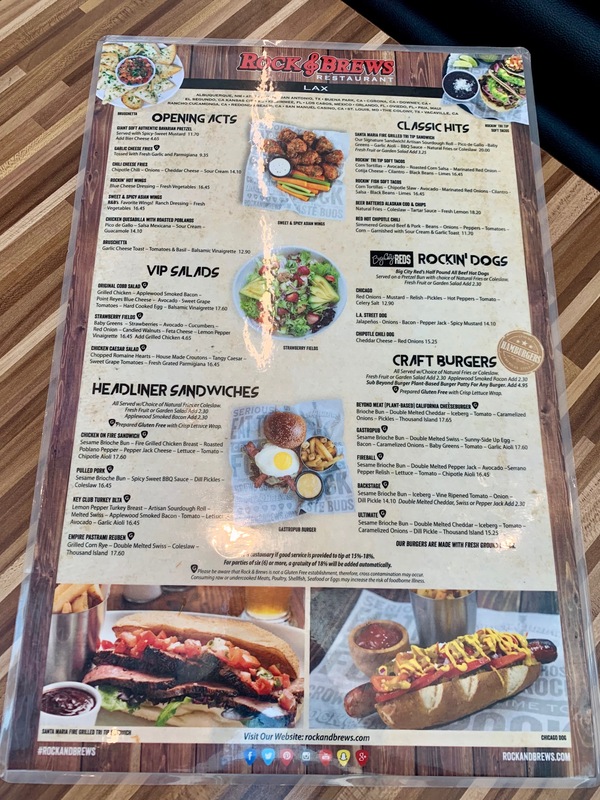 Have you tried Rock & Brew? What did you think? I was reading the culture of tipping started when the white southern slave owner f$%kwads wouldn’t pay living wages to blacks. So tipping was used to make up the difference. Once again white Republican male trash show why they are despicable human beings and a nuisance to the rest of us. Another reason to dump tipping. I hate the practice vehemently. Tipping is good when done freely but not when it is the mandatory part. Ever been on free tours with mandatory suggested tips? You can actually get to T3 and T2 post-security from TBIT using the free Delta shuttle bus. We’ve done this several times to visit the Virgin lounge with Priority Pass when flying out on other airlines. No one asked for our boarding pass. It is a lengthy walk from where they leave you in TBIT, so leave plenty of time. If your priority pass didn’t allow guests, could you still have gone in to order only $28 worth of food to share? Next, if your priority pass did allow one guest (only), could you have brought in 3-4 pax but only order $56 worth of food to share (and make sure the restaurant does not charge for the third and fourth guest to the pp)? Miss Santa Maria Tri-Tip so much. Used to have it a lot when I lived in California.